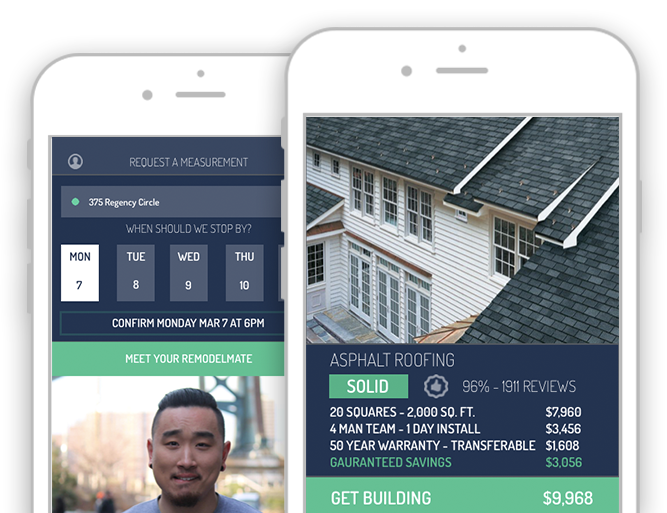 Get matched to the best contractors, get started in as little as 7 days. You can find anything from your next meal to your next job with the click of a button. Shouldn’t finding a contractor be just as simple? RemodelMate makes it happen. The home improvement help you need – without the hassle you don’t. Save yourself hours of research and get straight to finding contractors who can make your project happen. Every contractor on our site is vetted by our team and comes with the RemodelMate stamp of approval. We’ll tell you how much your project will cost – materials and labor. No more hidden expenses, no haggling required. Be the first to know when RemodelMate is live and ready for your neighborhood. Thanks for signing up for RemodelMate! Know someone you think should hear about us? Share this page with them! Copyright © 2016 RemodelMate, Inc. All rights reserved.